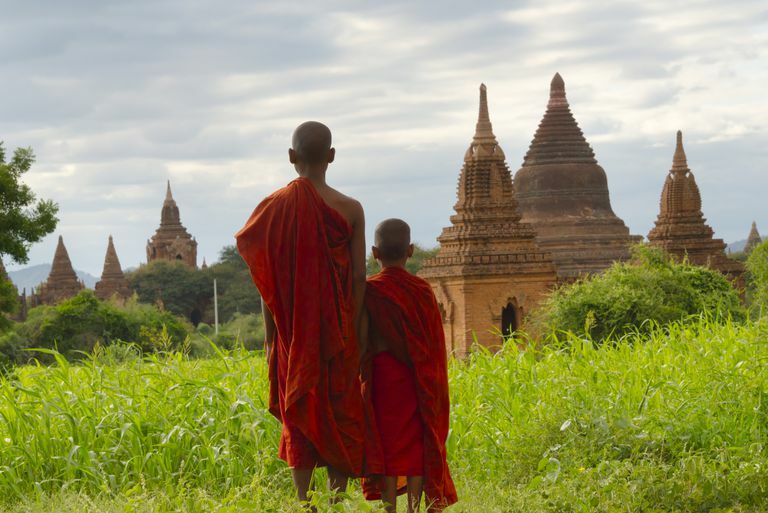 The "Teachings of the Elders"
Theravada is the dominant school of Buddhism in Burma, Cambodia, Laos, Thailand and Sri Lanka, and it has more than 100 million followers worldwide. The form of Buddhism that developed elsewhere in Asia is called Mahayana. Theravada means "doctrine (or teaching) of the elders." The school claims to be the oldest existing school of Buddhism. Theravada monastic orders see themselves as the direct heirs of the original sangha established by the historical Buddha. Is this true? How did Theravada originate? Although much about early Buddhist history isn't clearly understood today, it appears sectarian divisions began to crop up shortly after the death and parinirvana of the Buddha. Buddhist councils were called to debate and settle doctrinal disputes. In spite of these efforts to keep everyone on the same doctrinal page, however, by about a century or so after the death of the Buddha, two significant factions had emerged. This split, which occurred in the 2nd or 3rd century BCE, is sometimes called the Great Schism. These two major factions were called Mahasanghika ("of the great sangha") and Sthavira ("the elders"), sometimes also called Sthaviriya or Sthaviravadin ("doctrine of the elders"). Today's Theravadins are the not-entirely-direct descendants of the latter school, and Mahasanghika is considered a forerunner of Mahayana Buddhism, which would emerge in about the 2nd century CE. In standard histories Mahasanghika is thought to have broken away from the main sangha, represented by the Sthavira. But current historical scholarship says it may have been the Sthavira school that broke away from the main sangha, represented by the Mahasanghika, not the other way around. The reasons for this sectarian division are not completely clear today. According to Buddhist legend, the split occurred when a monk named Mahadeva proposed five doctrines about the qualities of an arhat to which the assembly at the Second Buddhist Council (or the Third Buddhist Council according to some sources) could not agree. Some historians suspect Mahadeva is fictional, however. A more plausible cause is a dispute over the Vinaya-pitaka, rules of the monastic orders. Sthavira monks appear to have added new rules to the Vinaya; Mahasanghika monks objected. No doubt other issues were in contention as well. Sthavivra soon divided into at least three sub-schools, one of which was called Vibhajjavada, the "doctrine of analysis." This school emphasized critical analysis and reason rather than blind faith. Vibhajjavada would further split into at least two schools -- more in some sources -- one of which was Theravada. The patronage of the Emperor Ashoka helped to establish Buddhism as one of the major religions of Asia. The monk Mahinda, thought to be a son of Ashoka, took Vibhajjavada Buddhism into Sri Lanka ca. 246 BCE, where it was propagated by monks of the Mahavihara monastery. This branch of Vibhajjavada came to be called Tamraparniya, "the Sri Lankan lineage." Other branches of Vibhajjavada Buddhism died out, but Tamraparniya survived and came to be called Theravada, "teachings of the elders of the order." Theravada is the only school of Sthavira that survives to this day. One of the early achievements of Theravada was the preservation of the Tripitaka -- a large collection of texts that includes the sermons of the Buddha -- into writing. In the 1st century BCE, monks of Sri Lanka wrote out the entire canon on palm leaves. It was written in the Pali language, a close relative of Sanskrit, and so this collection came to be called the Pali Canon. The Tripitika was also being preserved in Sanskrit and other languages, but we have only fragments of those versions. What has come to be called the "Chinese" Tripitika was pieced together mostly from early Chinese translations of the now-lost Sanskrit, and there are some texts that are preserved only in the Pali. However, since the oldest extant copy of the Pali Canon is only about 500 years old, we have no way to know if the Canon we have now is precisely the same as the one written in the 1st century BCE. From Sri Lanka, spread throughout southeast Asia. See the articles linked below to learn how Theravada was established in each country.